The beauty of this dish is that you don’t have to find fresh morels — it can be made just fine with dried mushrooms, which are available year round. A word of advice: It’s well worth it to make the effort of preparing homemade chicken broth or homemade vegetable broth. I would discourage using bouillon cubes in any preparation as they lend a chemical flavor. 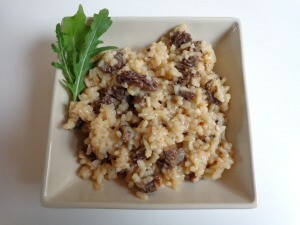 As for the rice, you will get best results if you use an imported Italian risotto rice, such as carnaroli or arborio. If using dried morels, soak them in 1 cup (1/4 liter) warm water for one hour before proceeding with the rest of the recipe, then drain well and pat dry with paper towels. If using fresh morels, brush away any bits of forest that are clinging to the mushrooms and trim off the ends. In either case, slice in halves or quarters. Put the broth over a medium flame and bring to a simmer. Leave this pot on the heat while you proceed with the recipe. In a heavy-bottomed pot with a cover, heat the olive oil to sizzling. Add the minced onion. Cook until wilted over medium-high heat, about 1 minute, stirring frequently. Do not let the onion brown. Add the rice and sauté until it turns translucent, about one minute. Add the white wine and cook until it has been absorbed. This goes very quickly. Stir to ensure the rice doesn’t stick. Add the mushrooms and stir. Add the hot broth to the rice. Stir well, turn down the heat, cover the pot, and simmer gently until almost all of the liquid is absorbed, about 15 minutes. Remove from heat. Add the butter and parmesan. Stir well to mix. Taste. Grind in some black pepper. Add a little salt and taste again — you may not need to add much because there is salt in both the broth and the parmesan. Adjust as necessary. Return to the heat for one minute more to allow the flavors to blend, then turn off the heat, cover the pot and allow to rest for 2 minutes. Serves 2 as a main dish, 4 as a side dish.